From Wisdom to Alzheimer’s: Are we poisoning ourselves with affluent malnutrition and sedentary life style? Wise elders, grand parents or statesmen have been the traditional roles for aging adults. Older people were revered as the repository and sources of wisdom in many traditional cultures. Presently the development of aging into wisdom is being overshadowed by the specter of Alzheimer’s disease. Wisdom transforming into Alzheimer’s disease does not compute. How come that in slightly more than a century after it was first described by the neuropathologist Alois Alzheimer in 1906, the fear of contracting and possible having Alzheimer’s disease with the concurrent loss of cognitive and body functions is becoming a possibility? How could this have occurred? Today more people are living to older ages; however, in traditional cultures some people also lived to very old age (the major increase in present day longevity is due to the elimination of infant and maternal mortality and medical treatment to survive trauma). Is it possible that the prevention of Alzheimer’s will not be found in pharmaceutical treatment but in promoting organic food diet and movement? The research data is starting to find that our life style patterns are risk factors for Alzheimer’s. Changing lifestyle factors is a more promising treatment approach than drugs. A significant risk factor may be the confluence of a sedentary lifestyle and affluent malnutrition. Researchers are even reporting that the built up of the beta amyloid plaques in brains of people with Alzheimer’s disease is not the result of aging but the body’s attempt to cope with the influx of environmental and dietary poisons or decreases in essential foods or body activities. Over the last hundred years–and rapidly accelerated in the last 30 years–we have transformed work into sitting. By sitting in front of a computer screen, we have created a new disease: Immobilization Syndrome. Lack of exercise is recognize as a major factor in numerous illnesses such as cardiovascular disease, obesity, and diabetes. Movement in many different forms reduces the risk of illness. Older people who exercise have a significant reduction in the risk of developing Alzheimer’s (Larson, 2006; Radak et al, 2010). Regular movement lowers the risk. Even though there is overwhelming scientific evidence that movement and exercise are required for health, there is a disconnect with the medical and educational practices. Insurances will pay for medical treatment; however, they usually will not pay for prevention or exercise. At the same time physical education in schools is reduced or eliminated to reduce the risk of litigation (an injured child on the playground could sue the school). Children now spend most of their time in front of a screen while exercising their thumb and index fingers instead of playing and moving outdoors. Affluent malnutrition appears to be another risk factor. Recent findings suggests that the beta amyloids plagues, as the marker for Alzheimer’s in the brain, may be a protective response to the modulating insulin levels triggered by affluent malnutrition and sedentary life style. This disease has been labeled as type 3 diabetes by Associate Professor Suzanne de la Monte at Brown University (Steen et al, 2005). Namely, the disease occurs as the brain tissue becomes resistant to insulin. Rats that are fed high-fructose corn syrup laced water experienced learning and memory problems in less than 6 weeks and became less responsive to insulin. At the same time if the animals were given omega 3 fatty acids, they appear to escape the cognitive decline. In other research rats developed Alzheimer like brain changes and became demented when Suzanne de la Monte interfered with how the rats brains respond to insulin (Trivedi, 2012). Alois Alzheimer first described these abnormal protein structure in the brains a little more than a hundred years ago. At that time the European diet had increased sugar intake as shown in figure 1. 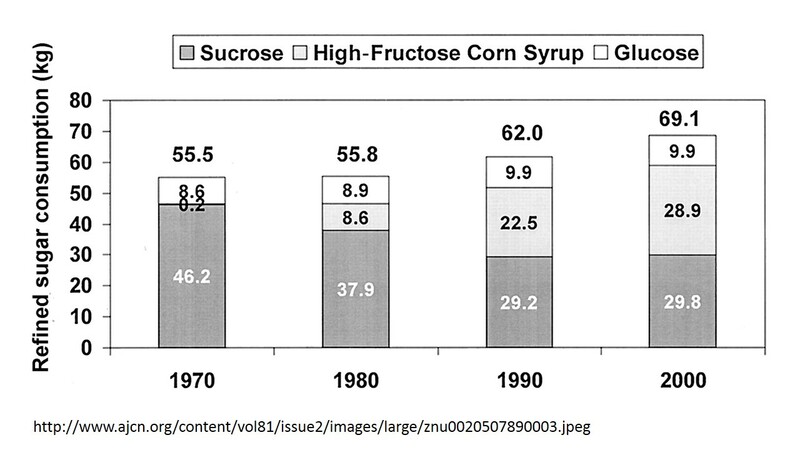 While more recently there has been a significant increase in high fructose corn syrup as shown in figure 2. We are now becoming concerned with the Alzheimer’s disease as an upcoming epidemic. 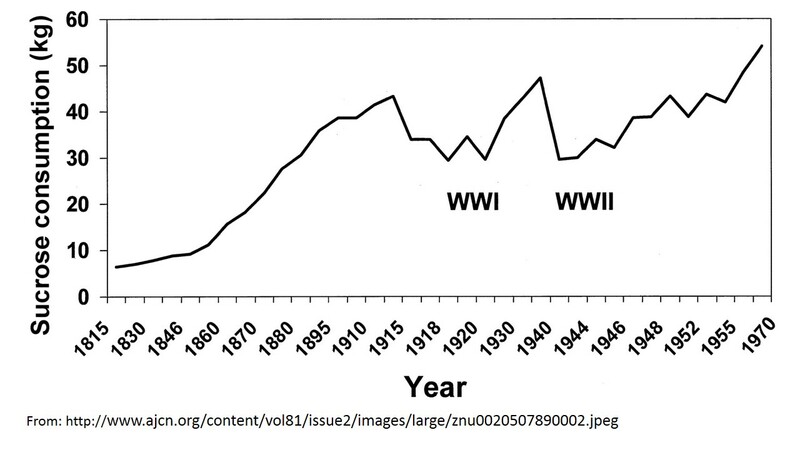 It cannot be just sugar; since, its consumption has been high since the beginning of the 20th century. A possible contributor could be the high-fructose corn syrup; however, it is most likely the interaction between reduced exercise and sugar. Sugar set the stage for pathogenesis to occur in the brain and the absence of movement/exercise promotes and supports the pathogenesis. People continue to decrease movement: from walking or riding horses to sitting cars or standing on escalators and elevators; from doing physical housework to automated washing machines, driers and dishwashers; from preparing foods from raw materials to prepackaged foods; from filing and typing to computer work; from playing family games to watching TV and searching the net; from face to face communication to texting; etc. We have separated from our biological evolutionary heritage. I am not surprised that Alzheimer’s disease and immobility and sugar are linked. Adopt the precautionary principle and assume that sugar and high-fructose corn syrup in conjunction with reduced movement (immobilization syndrome) is harmful. As a reader, you will probably have to wait another 20 years before these findings have been scientifically proven against the overt and covert lobbying efforts of agribusiness and pharmaceutical industry. Remember it took 30 years to demonstrate that smoking was harmful. Begin to move and eat in concert with your evolutionary background (See Part III Self-care in Gorter and Peper, 2011). Eat food not sugars! Eat the foods great grandparents would recognize as food as Michael Pollan (2009) describe in his superb book, In Defense of Food: An Eater’s Manifesto. Eat foods that have not been processed or adulterated by additives. Take charge by eating brain supporting foods such as organic vegetables, roots, fruits, nuts, fish, some organ meat, and eliminate all those sugary, fatty processed highly advertised fast foods. Move and exercise! Get up and move every hour. Walk up the stairs instead of the escalator. Meet new people and move by going hiking, dancing, Tai Chi or yoga classes or volunteer by helping others. Larson, E.G., Wang, L., Bowen, J.D., McCormick, W. C., Teri, L., Crane, P., & Kukull, W. (2006). Exercise Is Associated with Reduced Risk for Incident Dementia among Persons 65 Years of Age and Older. Ann Intern Med, 144(2), 73-81. Pollan, M. (2009). In Defense of Food: An Eater’s Manifesto. New York: Penguin Books. Radak, Z., Hart. N., Sarga, L., Koltai, E., Atalay, M., Ohno, H., & Boldogh, I. (2010). Journal of Alzheimer’s Disease, 20(3), 777-83. Steen, E., Terry, B.M. Rivera, E.J., Cannon, J.L., Neely, T.R., Tavares, R., Xu, X. J., Wands, J.R., & de al Monte, S. M. (2005). Impaired insulin and insulin-like growth factor expression and signaling mechanisms in Alzheimer’s disease-is this type 3 diabetes? Journal of Alzheimer’s Disease, 7(1), 53-80. Trivedi, B. (2012). Eat your way to dementia. New Scientist, 215(2880), 32-37.